Have you heard the saying, “40 is the old side of young and 50 is the young side of old?” Well Martha’s son is visiting from Connecticut and turned 50 on Monday so we all met at the Cofresi Resort to wish him Happy Birthday. Wendell is also a diabetic and fond of agave for sweetening his drinks and desserts. We had to have a cake of-course and Martha asked me to do the honors of baking Wendell a cake with agave nectar. This lime pound cake is made with 1/2 cup agave nectar instead of 1 cup of granulated refined sugar. Everyone enjoyed the cake which was luscious with the zest and juice of a large lime. I think the agave allowed the lime to really sparkle. It’s mango season here in Puerto Rico and they are plentiful after the winter rains. Native Puerto Rican mangoes are so sweet when tree ripened and the fragrance just perfumes the air. They’re all over the island and can be picked up along the interstate highways or picked right off the heavily laden trees surrounding the Balneario, board walk along the beach. 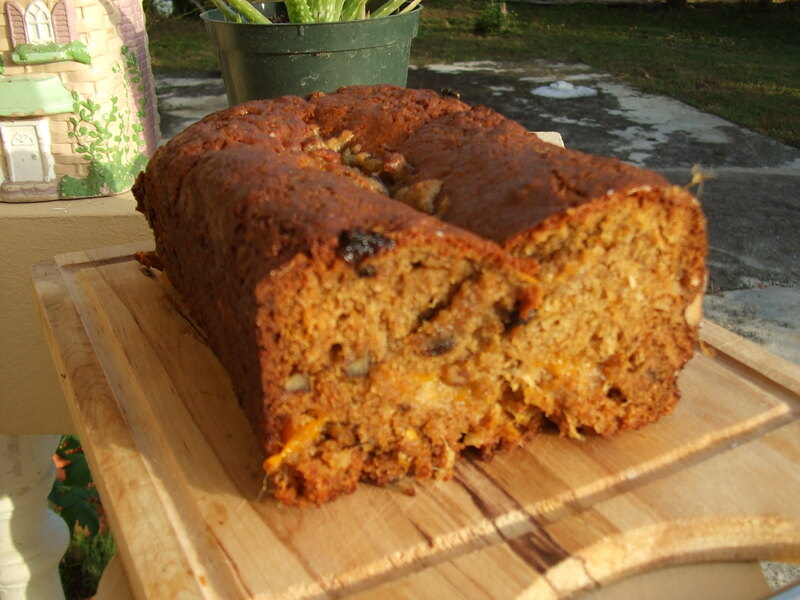 They make a lovely jam with saffron, smoothies with banana and yogurt, juice for rum punches, and quick breads. The semi-ripe mangoes make a terrific hot chutney or salsa with Scotch Bonnet chilies and the little green mangoes make a tangy sweet and sour pickle reminiscent of Chinese pickled cherries. 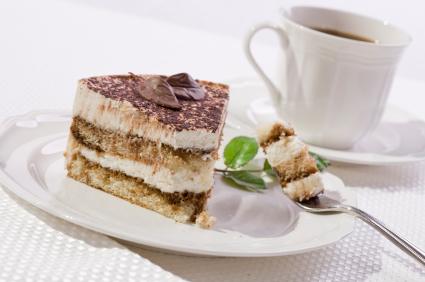 Tiramisu is that scrumptious dessert of zabaglione custard with mascarpone cheese, savoiardi (lady fingers) dipped in espresso and marsala, and dusted with cocoa powder. It was created in Treviso, Italy about 1970 by Alba and Ado Campeol, owners of the restaurant Le Beccherie. The classic recipe was made with raw eggs, a no-no due to salmonella potential, so the zabaglione is now cooked over steaming water. I first made this dessert in 1989 from a recipe in Ciao Italia Cookbook, the companion cookbook to Mary Ann Esposito’s TV series. She is in her 20th year as a cooking show presenter and was one of my mentors when I got the foodie bug. I carried her cookbooks to the South Pacific along with Joy of Cooking, Better Homes and Garden, and Sunset. This recipe parallels the classic tiramisu from Le Beccherie and you will love the creamy texture and luscious wine laced espresso flavors. If you don’t have marsala wine, rum and Kahlua may be used. Philadelphia cream cheese may be substituted for the mascarpone cheese. And day-old toasted sponge cake may be used in place of the savoiardi biscuits. Cream egg yolks with sugar until light and fluffy. Transfer to a double boiler. Stirring constantly, add 1 Tbsp espress coffee and 2 Tbsp marsala wine. Continue to stir and heat until zabaglione thickens and coats the back of a spoon. Remove to an ice bath to cool. Stir occassionally while cooling. Cream softened mascarpone cheese until light and fluffy. Fold into cooled zabaglione. Whip heavy cream until peaks form. Fold into zabaglione. The mixture will be the consistency of mousse. Add 5 Tbsp marsala wine to 1 cup espresso coffee. Dip each savoiardi biscuit into the espresso and quickly remove. Place 10 dipped savoiardi into the bottom of a 9 inch spring-form pan. Cover biscuits with half the zabaglione. Repeat layers. Cover the top of the tiramisu with foil or plastic wrap and refrigerate overnight or several hours. Remove foil and dust with 2 Tbsp cocoa powder. To serve remove spring form, slice into wedges, garnish with chocolate shavings or curls. Serve with your favorite coffee. 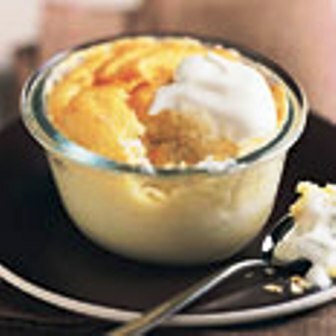 Meyer lemon budino is a sumptuous souffle that has its beginnings in San Francisco eateries. Budino, Italian for pudding, made with Meyer lemons, a cross between lemons and mandarin oranges, is redolent of a lemon meringue pie without a crust. Along with the balance of the sweet and tart characters of lemon is the creamy consistency of the pudding and crusty topping of whipped egg whites that rises out of the pudding during baking. Traditionally, it is served with whipped cream or cream fraiche and is an elegant light finale to a heavy meal. Berries and chocolate are also delicious accompaniments. The basic recipe lends itself to improvisation. Lavender will add another depth of flavor that becomes apparent after the first bite and lingers until the last. Adding ginger will give the budino sparkle. Substituting another juice for the Meyer lemons will completely change the budino flavors but the basic light souffle and creamy texture will remain. Adapt the recipe given here and make it your own. Preheat oven to 350 degrees F. Butter 6 ramekins (3/4 cup size) and dust with sugar. Combine 1/2 cup sugar, egg yolks, flour, lemon juice and lemon peel in large bowl, whisk until blended. Whisk in milk. Using electric mixer, beat egg whites and salt in medium bowl until frothy, 1-2 minutes. Add remaining 2 tbsp sugar and beat until soft peaks form; the peaks should fall over when the beaters are raised from the bowl. Gently fold half the beaten egg whites into lemon mixture. When incorporated fold in remaining egg whites. Divide mixture among prepared custard cups using a spoon or ladle. Place custard cups in roasting pan. Pour enough hot water into the roasting pan to come halfway up the sides of the custard cups. Bake puddings until tops are golden and spring back when lightly touched, about 30 minutes. Substitute mandarin orange juice and zest for the lemon components. Add 1 tsp of anise seeds to the beaten egg whites before folding into the batter. Serve with chocolate shavings and a dollop of whipped cream. Steep 1 Tbsp lavender (McCormick’s Gourmet brand) in ½ cup warm milk for 30 minutes or longer, stain through a fine mesh sieve, and add to the remaining milk before preparing the lemon batter. Add 1 tsp black poppy seeds to beaten egg whites before folding into lemon batter.